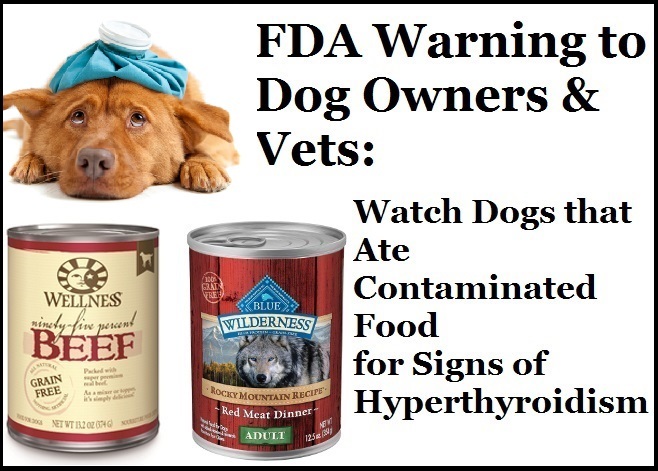 FDA Warning Dog Owners & Vets: Watch for Hyperthyroidism from Contaminated Food – FIREPAW, Inc. Excessive thirst and urination, weight loss, increased appetite, restlessness, hyperactivity, elevated heart rate, rapid and/or labored breathing, vomiting, and diarrhea. Continued exposure to excess thyroid hormones can cause damage to the heart and in some cases, death. If your dog has shown signs of hyperthyroidism discontinue feeding of these foods and consult your veterinarian, making sure to provide your dog’s dietary history, including what the dog has been eating, how much, and for how long, the FDA recommended. -Consumers who have any of the recalled food should not feed it to their animals and can refer to the company press releases for further instructions about returns/refunds. -Consumers, veterinarians and industry can report pet food complaints to the FDA by clicking here. Pingback: FDA Warning Dog Owners & Vets: Watch for Hyperthyroidism from Contaminated Food – FIREPAW, Inc. | "OUR WORLD"